The Brady BMP®51 and BMP®53 Label Makers are designed for customers who need to make labels on the go in a variety of industries, including voice and data communications, electrical, facility and safety, product and panel manufacturing, and laboratories. It offers wireless connectivity options for designing and printing labels using Android smart phones and tablets. The BMP51 Label Maker features a large backlit display screen, easy-to-use label-design applications, a QWERTY keyboard and connectivity options for wireless printing, as well as material recognition and automatic label formatting to eliminate the need to calibrate the printer at start up. Other time-saving features include automatic font-sizing, high speed print (25.4mm per second), and USB PC connectivity for advanced label design with Brady’s LabelMark™ Software. The BMP51 Label Maker also offers a variety of material options with over 190 easy-to-load label cartridges to choose from, and prints on continuous or die-cut label materials up to 38mm wide. 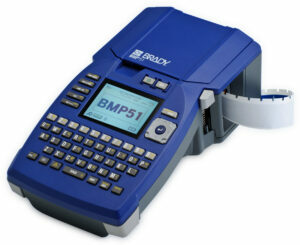 The BMP53 features the same advanced capabilities as the 51, but in the form of a peripheral only printer (i.e. it has no screen or keyboard).